What can flyball teach your agility dog? Flyball... You have to whisper it. It's a dirty word to some agility folk. They say it’s noisy, it’s dangerous and the dogs are out of control. But, what if we told you that flyball has more in common with agility than you think and could even help your agility dog? Beth Rachlis, who does both at a high level, says that Flyball has changed, and is more technical than ever. With good basic foundations, she thinks that dogs can do both and pick up the other sport more easily than those who haven't trained in either discipline. The foundation and ground skills needed are similar, just applied differently. Flyball is a relay race where a team of four dogs compete against another team to see who can complete in the fastest time. The dogs must go over four hurdles, trigger a box, catch a ball, and bring the ball back over the four jumps. The fastest team to get all four dogs to complete this successfully wins the leg/heat. A predetermined number of legs are run in each race. Usually this is between three-five legs per race, with about five-six races per day. Teams consist of up to six dogs, but only four run in each leg. Both agility and flyball are high-impact sports, so dogs need to have safe training and be in good physical shape when competing and training. As with agility, all training and foundation should be age appropriate. It goes without saying that all flyball training should be positive and reward based. Target work: The flyball box is a maximum of 30 inches wide and 20 inches tall. For safety, dogs are encouraged to have a ‘swimmer’s turn’; the dog hits the box with all four feet and pushes off with their back feet. For the fastest, best and safest turn, dogs should be horizontal on the box to try and distribute their weight and force evenly throughout their whole body. There are many ways to train a box turn, but one of the most popular is via shaping, using a target. This may include starting with a target on the floor, building up the difficulty, and eventually moving it to the box. Body awareness: This links in with target work. The box is small, and dogs do have to know where their feet are to be able to have a safe turn. Body awareness can also build up muscles to help support the dog’s spine, as well as increasing general performance. 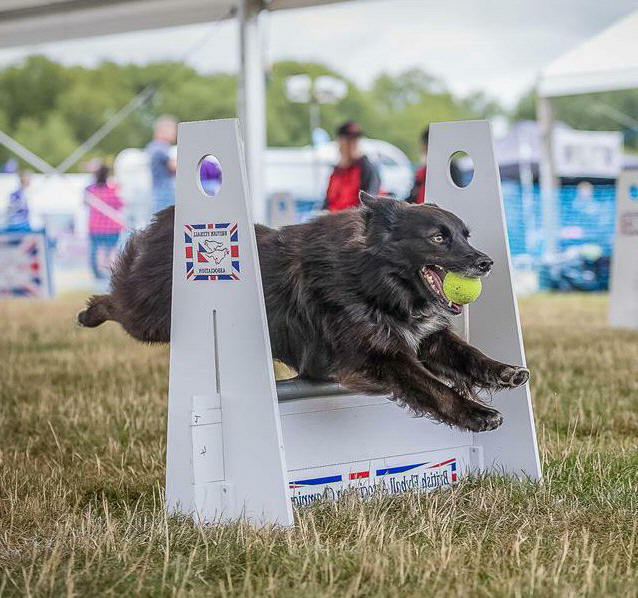 Stride work: The most efficient flyball dogs have a single stride between jumps, and usually 2-3 strides between the box and the first jump (usually a normal sized collie should do 3 strides between the box and the jump). This helps the dog have the most amount of contact with the ground, thus propelling them forward instead of hanging in the air. Recall: What would flyball be without the dog coming back to their handler? Essentially, flyball is just a competitive game of fetch. The aim is not to get the ball, but to bring the ball back! Recalling to your mum/dad, and ignoring everything else around you, keeps the dog safe. Toy drive: As with agility, flyball dogs thrive on the reward – the joy of coming back to your mum/dad, who has your BEST TOY! The toy/reward has to be better than the ball in the dog’s mouth, which can be difficult to overcome. Otherwise, the dog might drive up to the box, but may lack drive back – why come back if they already have the reward? Getting a good drive back is one of the hardest things in flyball and is often due to ball obsession. Good toy drive can also help drive dogs AWAY from you to the box, and create independence and forward focus. Impulse control and distractions: At any point, there could be 12 dogs, 20 + people in the ring, and any number of dogs outside the ring barking. It is noisy, busy, and full of distractions. Balls, treats, toys are everywhere, and the dog has to pick out its owner with everything going on. Dogs are racing, adrenaline is hyped up, and everyone has to remain safe. The dog should only go for the ball out of their box, when it is their time, and then come back to the handler. Dogs need to learn to leave any balls left lying around and not to interfere with any other dog or human. Independence: The flyball course is 102 feet long and you aren’t allowed to be next to your dog at all. Your dog has to drive forward go up over four jumps, turn on the box, and come back over the four jumps. You can of course encourage your dog, but if you step past the start gate you incur a penalty. Perseverance: It isn’t as easy as it looks. Seriously. Some dogs don’t like balls. Some dogs are ball obsessed. Some dogs like to chase other dogs, and some dogs don’t like the idea of other dogs running towards them at full speed, and others think that jumps are optional. Dogs develop at their own pace. You need to be creative and not give up. Teamwork: Flyball isn’t just about the dogs. You need the four dogs, plus the four handlers, a box loader, ideally someone to watch the line, someone to ball collect, someone to video, someone to take down times…. Everyone on the team has a job – and the dogs can’t race without a team! Flyball competitions are usually two-day events and that means spending the weekend camping. Confidence and Enjoyment: Dogs love it. You can see (and hear!) the buzz. Divisions: Teams are grouped together based on speed, much like grades are grouped together on ability in agility. Teams carry their times from one tournament to another. It wouldn’t be very fair to run a 23 second team against a 17 second team. This makes the divisions more competitive. Height dogs: These are very valuable dogs. Jump heights range from 6in-12in and are based on the height of the smallest dog. A small dog on the team can reduce the jump heights down for all other dogs – meaning all dogs can go faster. Hardest part of it all? Fitting it all in. Weekends clash and diaries have to be planned out months in advance. If you miss a flyball competition, you could let the team down. If you miss an agility competition, you can miss seeing your friends or getting that elusive win to move up. But, with either sport, you get to spend your time with your best friend – and that is what really matters. There are two main flyball organisations in the UK. The British Flyball Association (www.flyball.org.uk) and the United Kingdom Flyball League (https://www.ukflyball.org.uk/). Both organisations have regional experts to help you find your local team and can offer training advice. 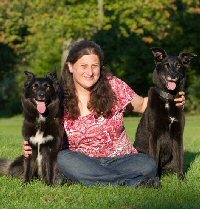 Beth Rachlis lives in Newcastle upon Tyne with her two rescue dogs. She started flyball training in 2009 with Amber, who has recently gained her Ice Blue Moon Award for 20,000 points, and still enjoys her daily veteran agility run. She also runs Izzie, a Grade 7 Agility Dog who has recently gained her Flyball Dog Graduate (3,000 points) award. Izzie has also represented Team UK in the ParAgility World Championships in 2017 and 2018. I’ve found is that the intense stride work I've put in for Flyball, makes striding on running A-frames very easy. The dogs just don’t ever think of not doing the right strides, so my A-frames are taught in about two sessions! I've also used wing wrap work in Flyball to tighten up my box work and vice versa. I use front crossing handling to teach handlers how to work their dogs to get tighter and snappier box turns. 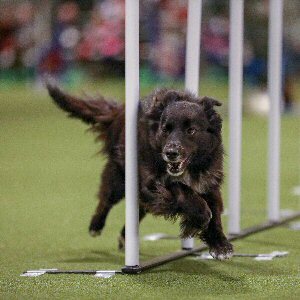 Flyball work helped me in agility to teach independence. My dogs are always confident to work at a distance from me in agility as this is what they have to do in flyball.